Having disgraced his Service, James Bond is sent by M on a mission to eliminate Francisco Scaramanga - a job which will almost certainly mean his own death. Scaramanga is the most lethal assassin in the World, and has caused widespread damage to the Secret Service. 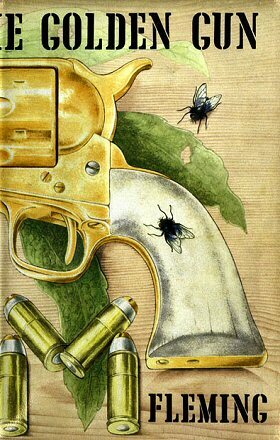 Above: British Pan paperback 10th edition (1972). "Bond was a good agent once," said M. "There's no reason why he shouldn't be a good agent again. Get me the files on Scaramanga. If we can get him fit, that's the right sized target for 007." "But that's suicide, Sir! Even 007 could never take him...."
A man claiming to be James Bond, missing presumed dead after You Only Lives Twice arrives in London and does indeed turn out to be 007. However, Bond is acting suspiciously, and in a meeting with M he pulls a gun on Admiral Sir Miles Messervy (we learn his name for the first time), but M fires a protective barrier down and stops the cyanide hitting him. Bond is apprehended, and it turns out he was found by the Russians in Vladivostock and, because of his amnesia, was persuaded to become their agent. M gets Sir James Molony to turn him back, and sends 007 on one of his most perilous missions. To kill ‘Pistols’ Scaramanga, the notorious killer now working for Cuba. 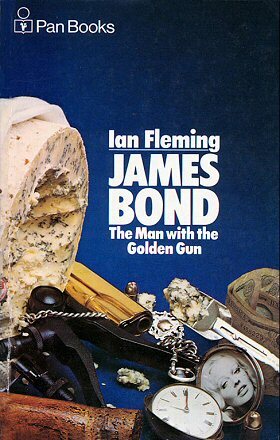 Bond tracks Scaramanga down by spotting a note to him in an airport pigeon-hole, and after bumping into Mary Goodnight Bond meets Scaramanga at a brothel and persuades Scaramanga to take him on as personal assistant and head of security for a meeting for investors in his hotel. At the hotel, the investors turn out to be top hoods from around the world. Felix Leiter is also at the hotel working as an electronics expert, and sets up bugs of Scaramanga’s meetings. Among other things, Scaramanga is involved with massive drug-smuggling and destabilising of the Western economy. However, Bond also hears the plan for his own death. 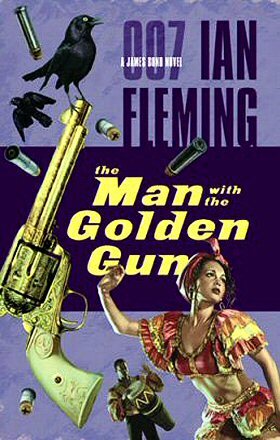 On the appointed day, Bond and the thugs go on a train journey, but Bond’s cover is blown when Mary Goodnight is tied to the track ahead. 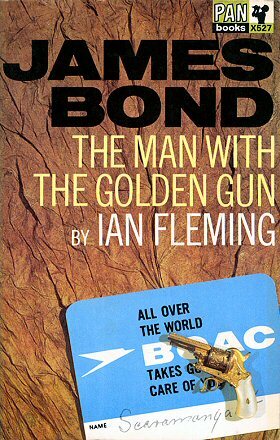 Amongst the ensuing gun-battle, Hendricks a KGB agent supposed to secure Bond’s death is shot, and Bond also hits Scaramanga. The dummy dressed up as Goodnight is destroyed. Leiter emerges from behind and disarms the villains, and tells Bond to jump from the train. He and Scaramanga, who survived a serious wound, follow suit, and the train and the hoods are destroyed by a bridge Leiter booby-trapped. Bond finds Leiter injured from his fall, and sets off in pursuit of Scaramanga, and finds the villain half-dead, but alive enough to pull a hidden gun as 007 is about to kill him. 007 falls, but before losing consciousness pumps several rounds into Scaramanga’s chest. Bond wakes up a week later, still alive from Scaramanga’s pellet after a local doctor realised the effects of its snake-poison. He and Leiter are debriefed, and Bond turns down a knighthood. In the final words of a Fleming novel, James Bond is persuaded to join Mary Goodnight at her bungalow. "He forced himself to think of what the broken body of Margesson must have looked like, of the others that this man had killed, of the ones he would kill afresh if Bond weakened. This man was probably the most efficient one-man death dealer in the world." "At Blades, M ate his usual meager luncheon, a grilled Dover sole followed by the ripest spoonful he could gouge from the club Stilton." "Now it may only be a myth, and it is certainly not medical science, but there is a popular theory that a man who cannot whistle has homosexual tendencies... (M hadn't whistled since he was a boy. Unconsciously his mouth pursed and a clear note was emitted.)" "A naked arm smelling of Chanel No. 5 snaked around his neck and warm lips kissed the corner of his mouth. As he reached up to hold the arm where it was, a breathless voice said, 'Oh, James! I'm sorry. I just had to!'" "The big man stood for a moment and looked up at the deep blue sky. His fingers opened in a spasm and let go of the knife. His pierced heart stuttered and limped and stopped. He crashed flat back and lay, his arms flung wide, as if someone had thrown him away." "At the same time, he knew, deep down, that love from Mary Goodnight, or from any other woman, was not enough for him. It would be like taking ‘a room with a view’. For James Bond, the same view would always pall."